The main advantage of hubs – apart from the freedom from a crude and filthy external contraption dangling off the bike – is that of instant-change. The rohloff enables you to snap near-instantly from nearly any gear to any gear. If, through wanton day-dreaming, you find yourself in the wrong gear on a sudden up- incline: In the case of the deraileur you have to get off, lift the back and spin the wheel while the chain climbs over the cogs, an undignified admission of a mistake. In the case of the hub, it goes click and you are “in”. Joyful. No forward motion lost, no undignified scramble. This alone is such a boon. There is not even need to keep watch on which front ring you are on to enable optimum selection of cluster gear. It is so good to be liberated from the deraileur that I am exultant every time I get on the bike despite having had the hub gear over a year. Second childhood for me. 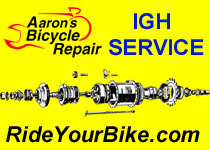 A great email we got from Phil W describing what he finds joyful about internal gear hubs.